I hope you all had a very, very, Merry Christmas! 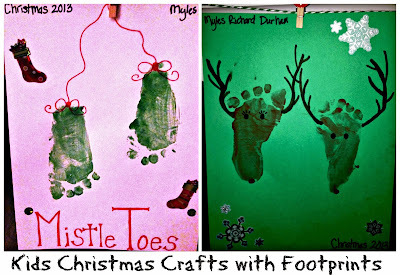 I have been loving reading all the Christmas posts so I wanted to share a couple festive activities we did to help us get into the holiday spirit and the little bit of Christmas Day I recorded. I have the Groupon app on my phone and every couple of weeks I check out what they have near us. I was SUPER excited when I found one for the holiday lights tour on a Classic Cable Car in downtown San Fransisco! I love touristy stuff like that, so I grabbed up my first Groupon real quick. 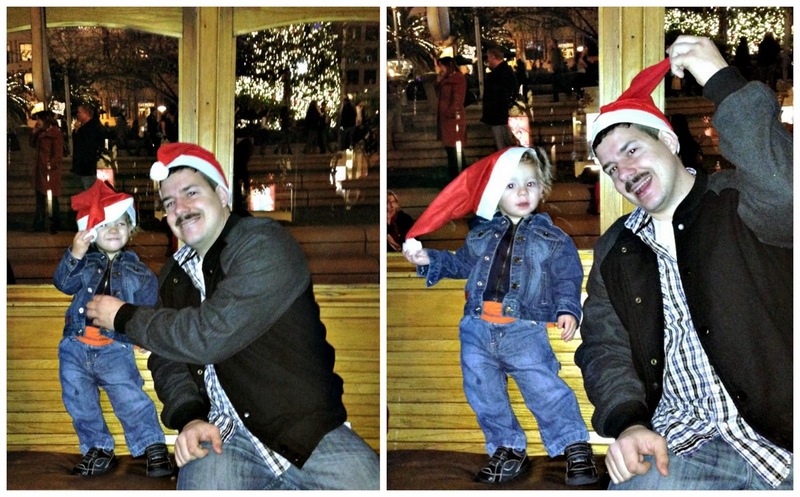 We took BART to Union Square. They were running a little behind so we were able to check out all the decorations in the Square before we took our tour. 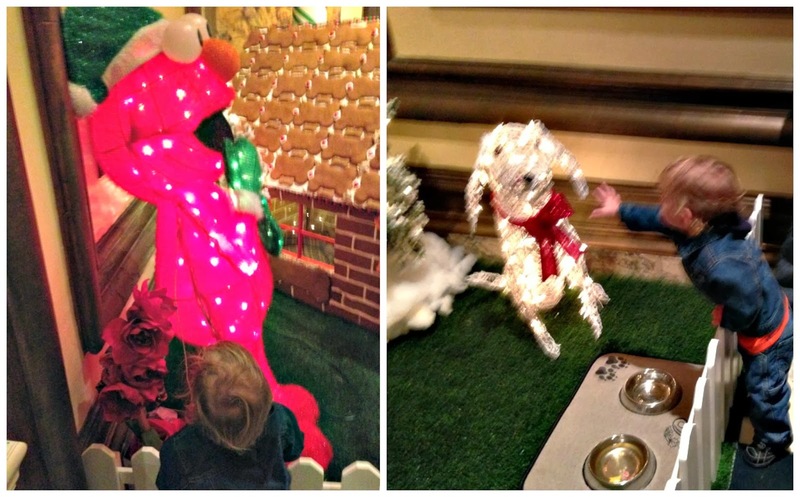 Myles was "Ooo" and "Aww" over all the lights and balls! Biggest Christmas tree I have ever seen! When we got on the Car, we were given Santa hats. 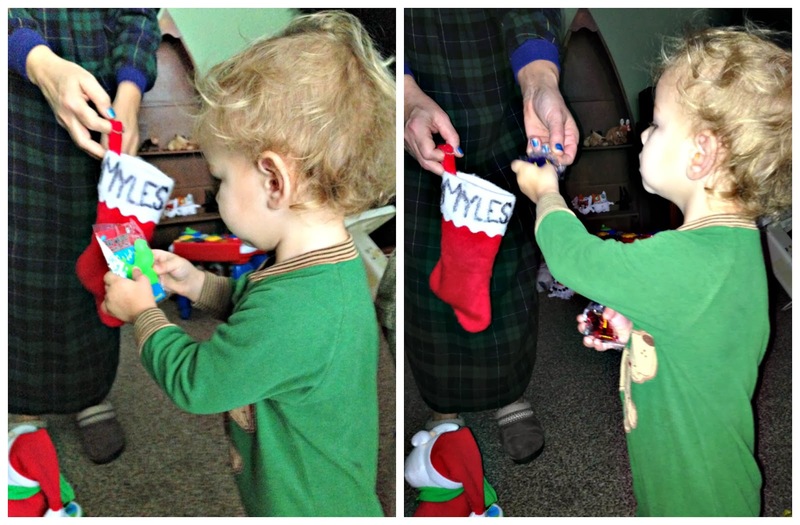 I can't believe Myles kept it on long enough for me to take a picture. The driver let him ring the bell. 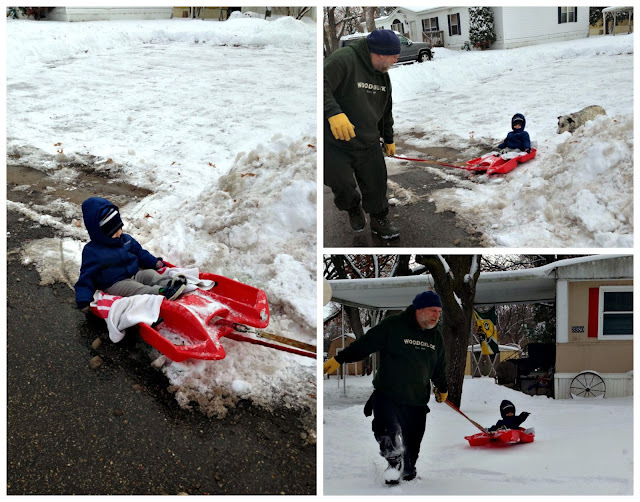 It was too hard to pull by himself, so daddy had to help him make it ring. 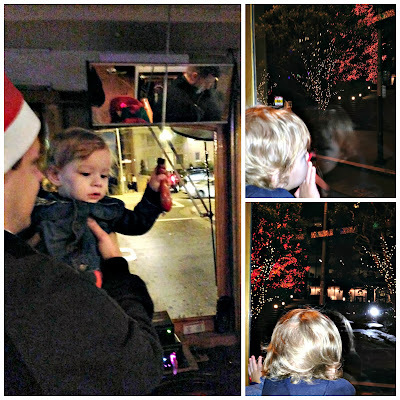 He loved looking out the window at all the 'pretties'. 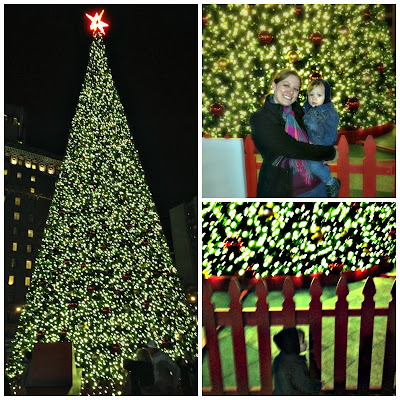 We rode around all over San Fransisco checking out all the Christmas lights, trees, and decorations. It is a pretty festive city! We also stopped at the Fairmont Hotel to check out their lobby. They had a huge 2-story gingerbread mansion made of graham crackers, peeps, and candy canes! The inside had a toy workshop and a train going around the outside. 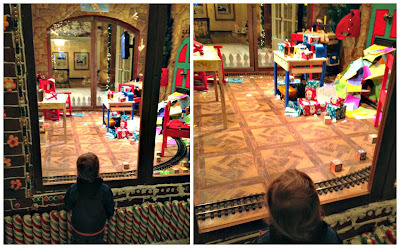 Myles was completely fascinated by the train; he just stood their watching it for at least 5 minutes. 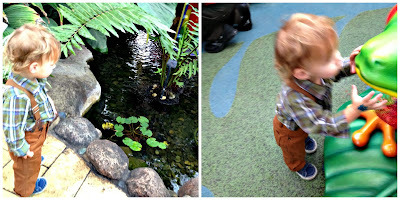 He also found "Memo" and a doggie he just had to touch! 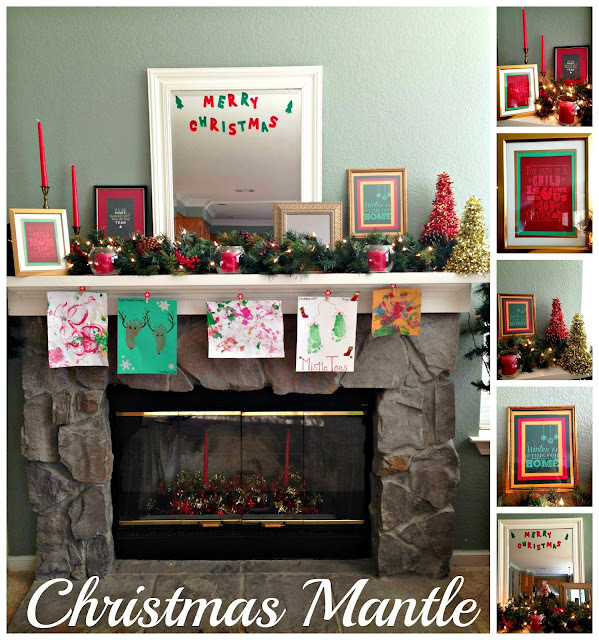 This was my favorite thing we did all holiday season. 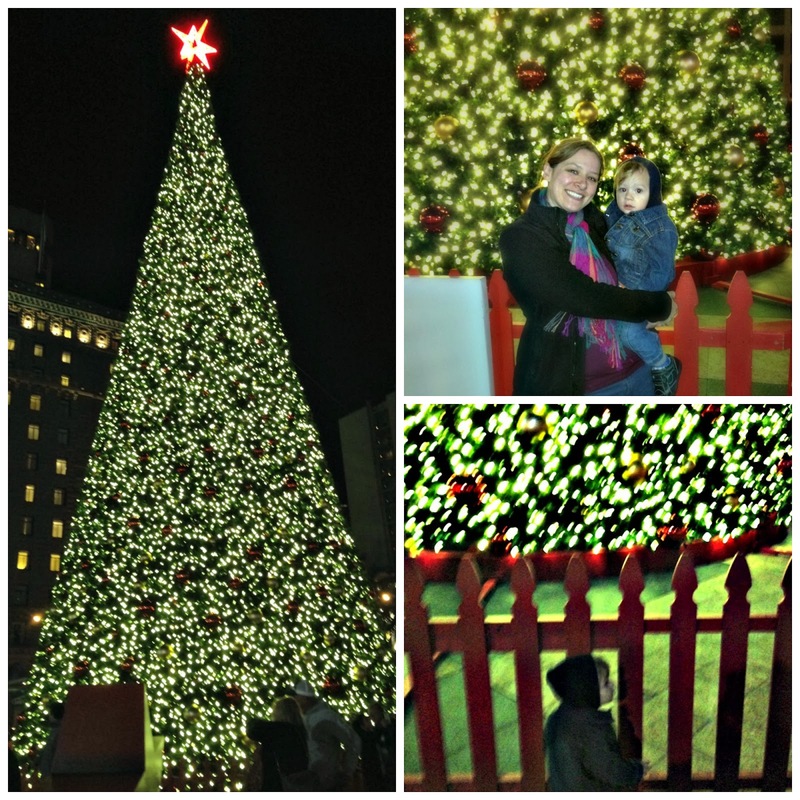 I would love to make it a yearly tradition and maybe add some Union Square ice skating and shopping once Myles gets older. When we went back home to Illinois for the holidays, I took Myles to have breakfast with Santa at the conservatory. 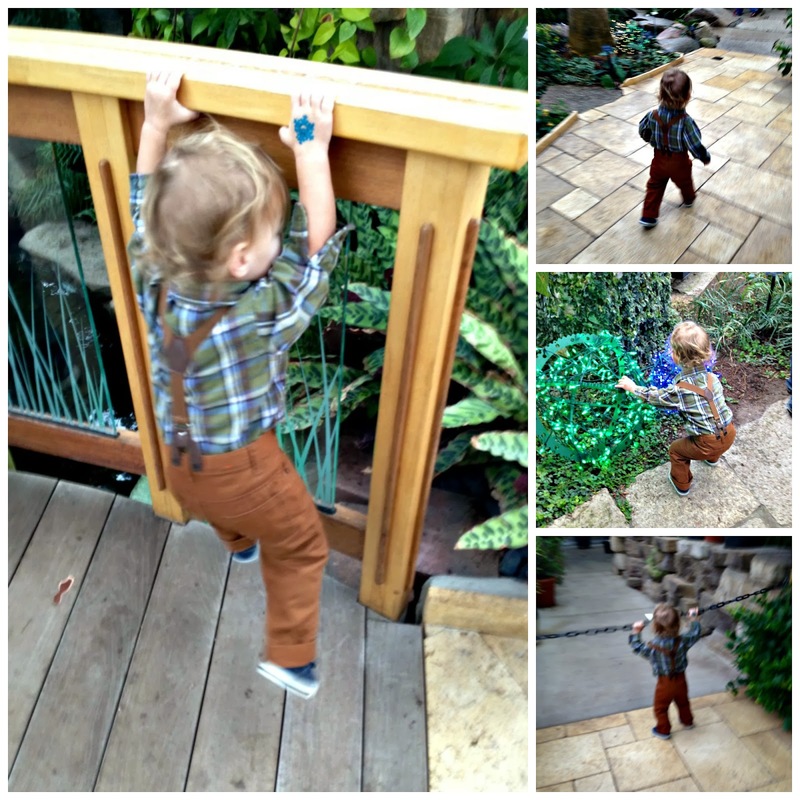 I had to dress him up in his finest gear :) I have been looking for suspenders for Myles for a long time, but I couldn't find them anywhere. Well when we got back to Illinois, grandma hooked us up with these beauties! Myles had a great time running around the conservatory, touching all the plants, climbing bridges, playing with the lights, trying to cross over into restricted areas, pointing at all the fish, and kissing frogs! 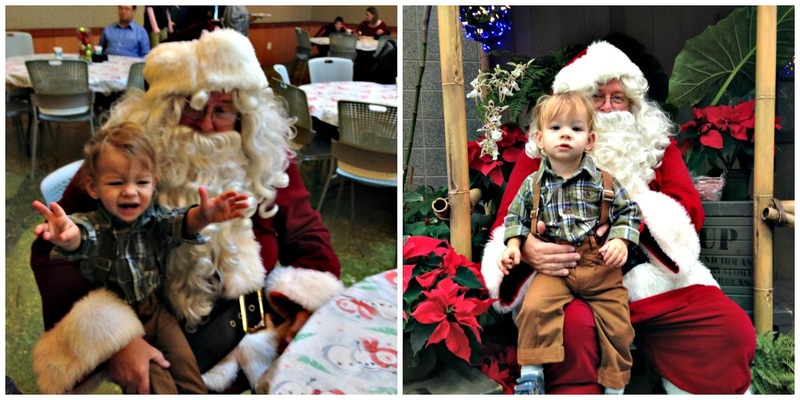 He got a snowflake tattoo, made watched the lady make him a snowman pillow, and chatted with Santa. When Santa first came by our table, Myles didn't really care too much about him, but he did give him a nice high-five! Since that went well, I tried get him to take a picture on his lap. 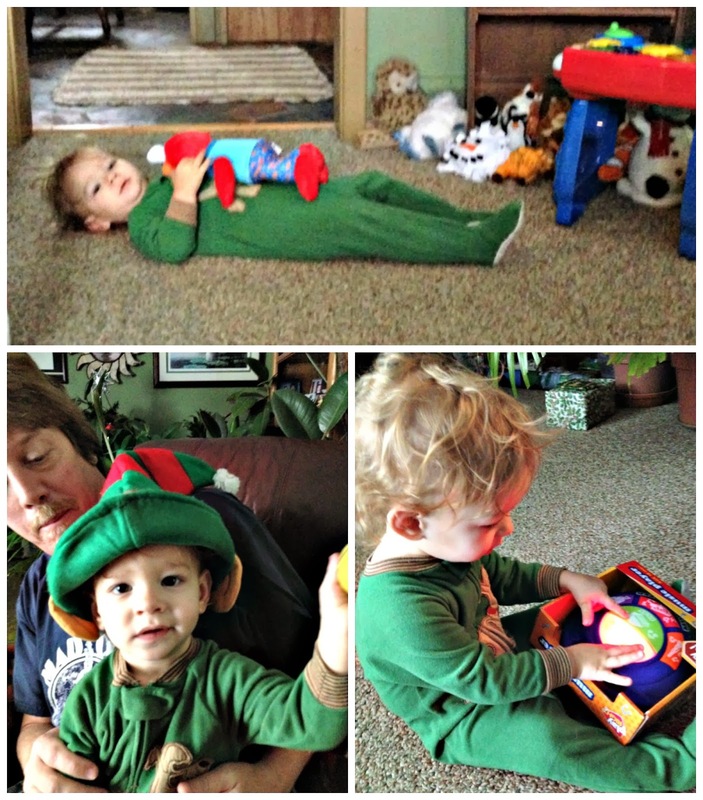 As you can see, that didn't go over too well: classic Santa fail! 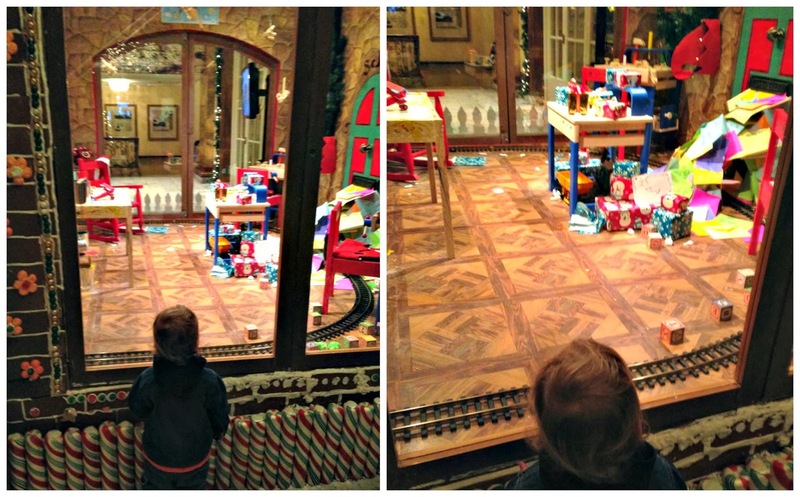 But then we caught Santa inside the conservatory and gave it another try... I didn't get a smile, but I think it turned out pretty good for our first Santa experience. Myles also went 'sledding' for the first time with grandpa. It's been so cold since we have been in Illinois that I didn't want Myles to go out to play in the snow. But one day when we were leaving grandpa's house, he put him on a sled and pulled him around for a couple minutes. 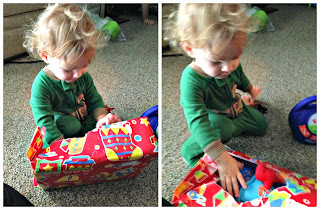 He really loved it! 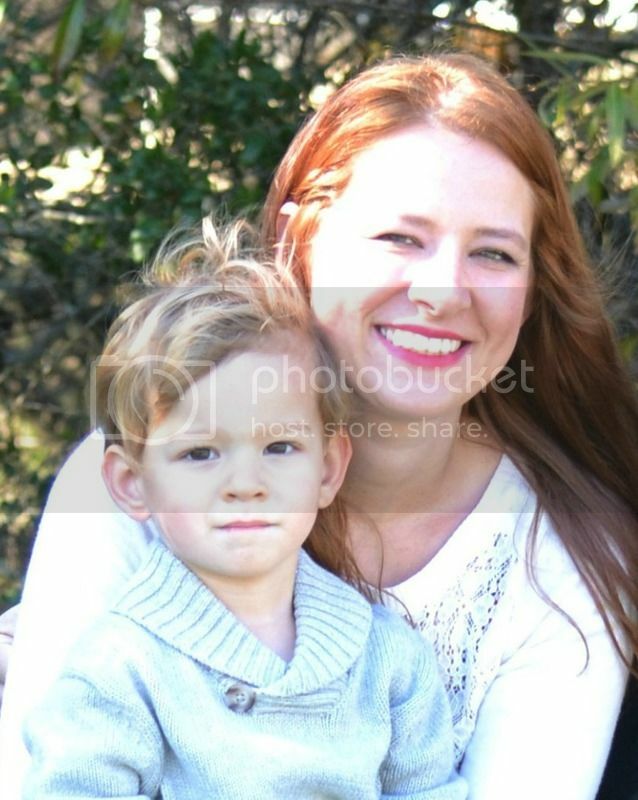 He was smiling the whole time and didn't want me to pick him up. I hope we get to take him 'real' sledding before we leave in a week. Christmas Eve and day I didn't take very many pictures. I wish that I had some more of us and family, but we decided to keep our phone usage and such to a minimum. Sometimes it's so nice to not have to worry about pictures, social media, texts, phone calls, etc. ; it's especially great when the day is spent with all our loving family! It was so great to enjoy the day with as little distractions as possible and really live in the moment. We created some great memories and I am for certain that this was the best Christmas of my life! Myles getting his stocking gifts: little race car and bird call! 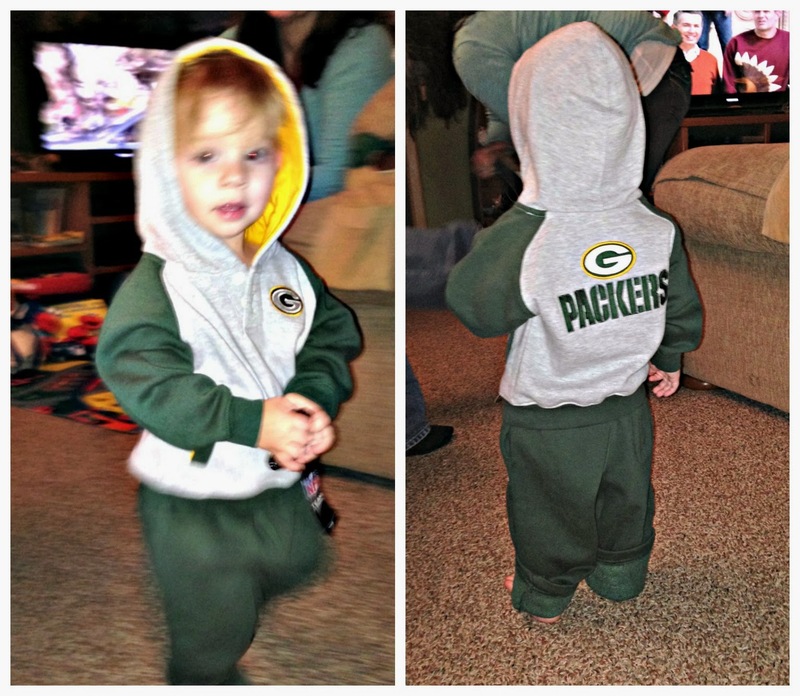 And lastly, Myles sporting his new Packer gear! Pretty sure the cutest thing I ever saw... Go Pack Go! 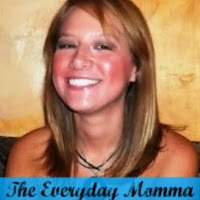 Our Guest Co-Host this week is Julia from The Everyday Momma! Julia uses only one word to label herself: mother. 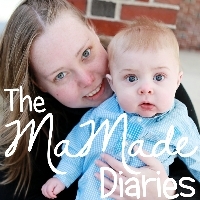 Julia's blog is all about being a mom highlighting breastfeeding and pregnancy. 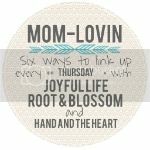 She also shares yummy momma friendly recipes as well as product review. She is the everyday momma. Our featured mama this week is Megan at Heartbeats and Little Feet. 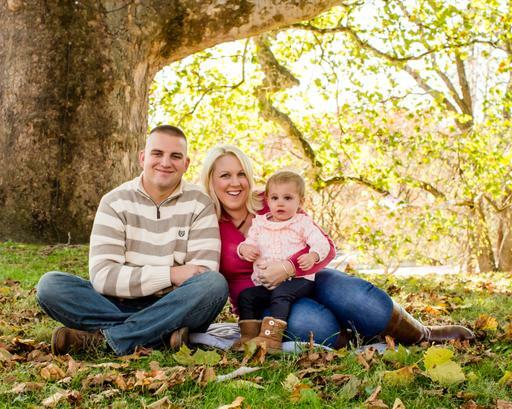 Megan's blog started as a way to make sure she would remember the life events she didn't want to forget. She writes about the high and the lows of their life as a family in Maryland. 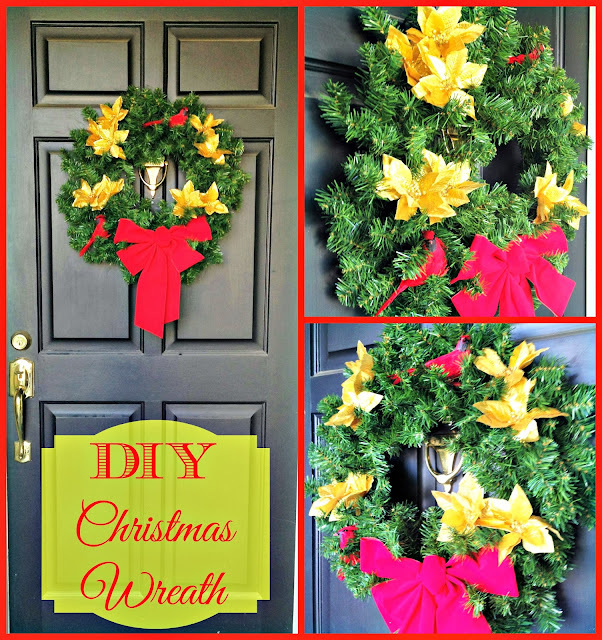 I picked up a plain green wreath at Goodwill for $4.00! Then I added some Dollar Tree accessories. I got a classic red ribbon, at two-pack of red cardinals, and two bouquets of gold flowers, that I took the stems off of. It is very simple, but I really like the way it turned out. I was going for a gold and red theme this year! 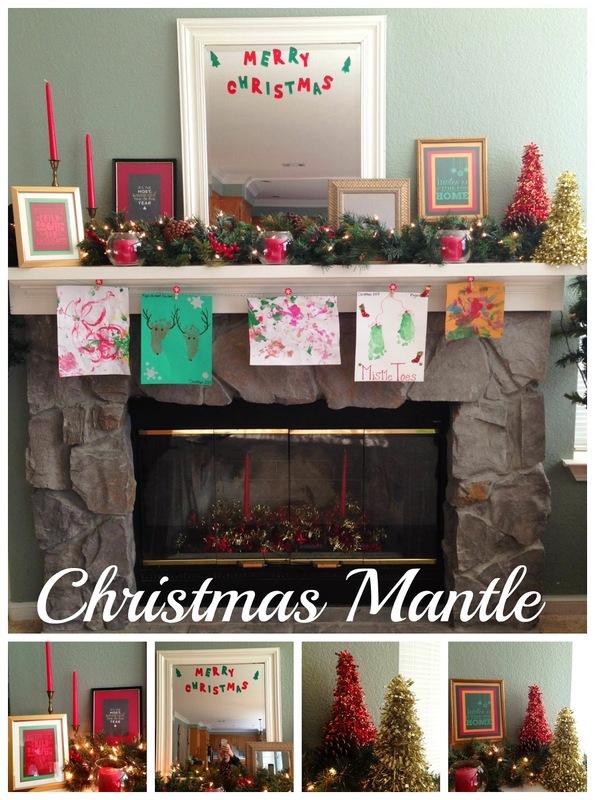 I really wanted to keep my mantle simple. I went a little over simple, but not too much! So, I am pretty proud of myself. I framed up a couple printables I found on Pinterest. Here is the "Winter is the Time for Home" printable, "For Unto Us" printable, and "It's the Most Wonderful Time" printable. I printed them out on colored paper and layered them with other colors in the background. I also picked up a couple gold frames at the Dollar Tree to go with my gold and red theme. They also had those really cute tinsel trees in my colors, so of course I had to grab them up. I threw two red tapered candles and some red and gold tinsel in the fireplace. 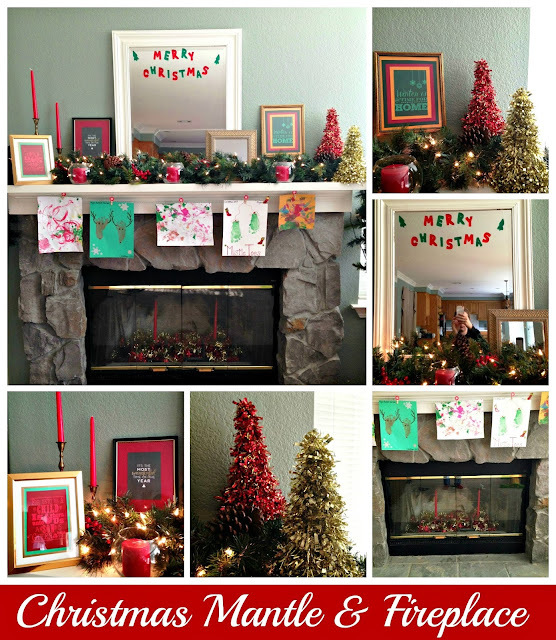 It is a gas fireplace and we are too scared to try it out, so I like to make it festive too. And the best part of the whole mantle: the display of Myles' art! I bought a kit for hanging Christmas cards at Target's Dollar Spot. It came with a green and white stripped string and 6 mini clothespins with a snowflake design glued on. I bought it because it was so cheap, but it could be a very easy DIY. Then you could customize the colors/patterns to your liking. I also did some footprint crafts with Myles. I put him in his highchair and gave him paper and paint to play with. While he was occupied with that, I made his footprints. It helped that he was in his chair, but it was not an easy task. As evident in the quality of the footprints, he was not very cooperative. I'm guessing the paint was cold because he kept moving his feet when I tried to put in on and then he wouldn't stay still when I try to make the print. They could have looked better, but it's the memory that matters. I saw both of these ideas on Pinterest and just made them on regular scrapbook paper. I added a couple stickers and his name/year for a keepsake. I love the hand/footprint art for keepsakes. I wish I would have started from the beginning with him, but I want to do it for every holiday from now on. Hope you enjoyed my Christmas decor tour! Hope you all are enjoying the holidays, your family, and all the beautiful decorations! 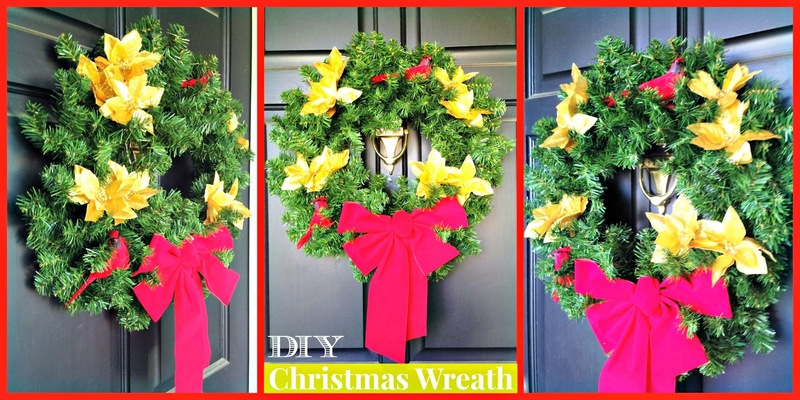 How is your holiday decorating coming along? 2. 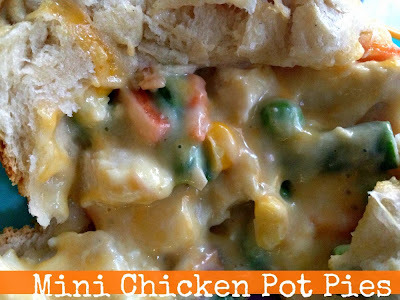 In medium bowl, combine vegetables, mushrooms, chicken, soup, cheese, garlic powder, salt, and pepper; mix thoroughly. 3. Lightly grease a muffin tin. Take one biscuit and press it out to make it wider, but not too thin (about 5 inches round). Place the biscuit over the top of the muffin cup. Spoon 1/8 of the mixture (about 2 tablespoons) onto the biscuit. Then press the mixture down into the cup, leaving some of the biscuit hanging over the edge of the cup. The mixture should reach the top of the cup. Then pull the extra dough over the filling towards the center. You can pinch the dough to keep it in place, if needed. 5. Repeat for the remaining seven biscuits. Then place in oven and bake at 375°F for 20 to 22 minutes or until biscuits are golden brown. 6. Remove from oven and let cool for 4-5 minutes. Enjoy! 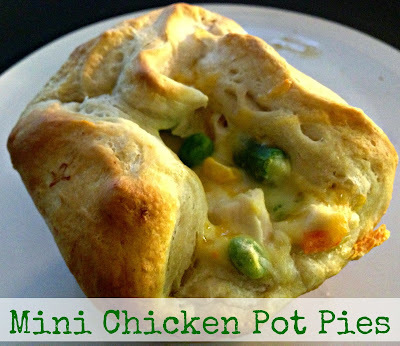 What are your favorite classic homemade meals? What are your favorite comfort foods? It's that time again friends! Time for another Social Media Sunday! As you know, Social Media Sundays are a place for you to connect with other bloggers in as many ways as possible, since meeting other bloggers and making new friends is one of the best parts of this online world! 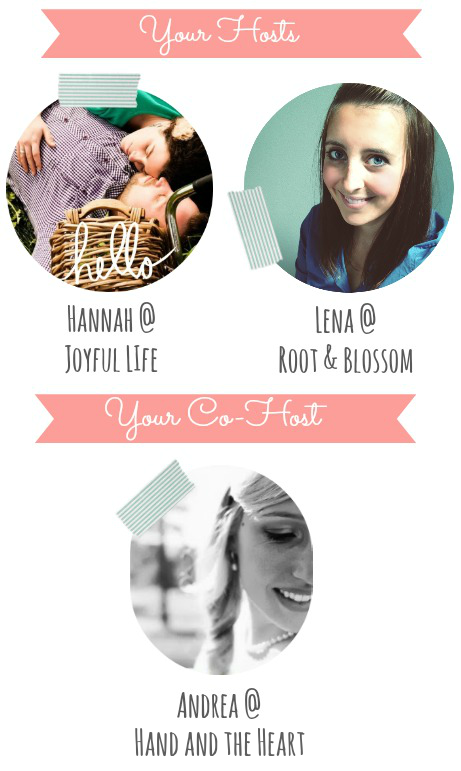 Follow your hosts and guest hosts (the first 8 in the link up) and leave a comment letting us know so that we can follow you back. Grab the button and spread the word, the more the merrier! Get to hopping! Check out your fellow bloggers and make a new friend or two! 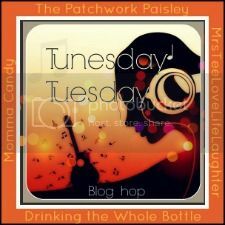 Normally I shy away from themed blog hops because I can never get a post done on time. If you are a regular reader around here, you may have noticed that I have a problem with being simple and concise. In real life, I have no patience and like to make things as short and sweet as possible. "Get in, and get out" is my motto these days. But when it comes to my writing, I am extremely detailed and thorough. I don't know if I could ever bring myself to do a Wordless Wednesday post :) I blame two things: my excessive need for perfection and my lovely OCD. In college, all I did was write papers and I got really good at creating lots of 'filler' to get to the required page/word count. So now I am hardwired to drag on and on in painstaking detail about every little point I am trying to make. This totally off-topic paragraph is a perfect example of me forcing you to be apart of my post-college writing syndrome. 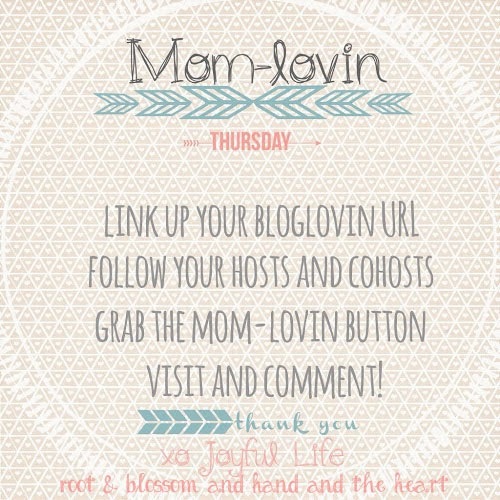 What I am trying to say is that I am doing something out of character for me and am joining a themed blog hop. I am making this exception because I feel like it is something that I need to re-connect with in my life. Sometimes life gets in the way of life and we are so frazzled by all that is going on that we don't make time for the things that make us happy. Sometimes you just have to get in touch with the core of who you are and I don't know anything that helps me do that better than music! I have had a passion for music since day one. It moves me like nothing else, takes me down memory lane, allows me to feel deeply, can instantly lift my mood, and brings joy to our household. I'll be honest, I am not the best singer (although it is one of my biggest aspirations), but I can jam out like nobody's business. I missed last week so I am going to double up and do both in one post. Last week's Theme: "Your Anthem"
Tupac's "Keep Ya Head Up"
I guess you would consider this a feminist song, but I wouldn't say that I am a feminist. I just love it so much because it speaks to the power of women and how really we are the ones that keep it all together! I don't diminish the role of the man as head of the household, but as women, our roles are equally as important. This isn't how I live my life, as far as the "use 'em and lose 'em" mentality nor do I condone that behavior. It is my anthem because of its sassy, clever lyrics and funky beat! This week's Theme: "A Song That Suits Your Current Mood"
Again there is no official video for this song, but I did find a live version on YouTube. It isn't the best quality, but I love Lauryn's voice live. This song has meant so much to me for so long. Even before I had Myles, I just felt such a strong connection to this song. I know part of it is simply because Lauryn is singing it. She has such emotion and conviction when she sings, it's hard not to feel it all the way down in your soul. I get all emotional EVERY time I hear this song. This song speaks to the pure miracle of pregnancy and child birth. Every child that has been placed into the womb of a woman was made specifically for her. And even though it may all feel like too much sometimes, God picked us to be the mother of our beautiful children, whom are created by His love. We all have tough days, but this song always reminds me how precious is the gift of a child! So what are your song choices for these themes? Comment below or create a post and link-up! I would love to know more about you all!